Nicht nur Tarek von Majesty sondern auch Patrik Johansson (Sänger), Tomas Olsson (Gitarrist) und Anders Broman (Bassist) von Bloodbound aus Schweden haben sich die Zeit genommen, zwei wissbegierigen Rock-Ladies einige Fragen zu beantworten. Es wurde viel gelacht und aus einem Interview wurde eine nette Unterhaltung. Das Ganze haben wir für euch auf Englisch festgehalten. NBNL: Hey Guys, how are you doing? Patrik: We are a bit tired. We had shows every night. 17 exactly and no days off. It is hard work but a lot of fun. NBNL: How is the tour until now? Patrik: Really good, we’ve been coming along with all the other guys so it is very relaxed in the bus and backstage. It has been really good, the shows as well. Tomas: The bus situation is different. We travel in a Nightliner. One night it can be a big venue and then a small venue but both is fun. A small venue is very crowded and familiar. NBNL: Do you go each other on the nerves when you sit there the whole time together? Patrik: Everyone is really cool. Tomas: We didn’t know any of the bands before. It was the first time we met them but they are really nice, so everyone seems to be. Patrik: We are really nice as well! Tomas: Yeah, we’re even nice as well. NBNL: What is your best tour experience so far? Is there anything special? Tomas: We played in Leipzig. It was a really small place, a little bit smaller than today and we didn’t know what to expect … but then in the evening, the place was packed and the crowd was screaming. Sometimes you couldn’t hear anyone, who played their instrument. That was very cool. NBNL: Was there a bad experience? Anders: No not on this tour until now. Patrik: For example little backstage areas for so many people … only small stuff, nothing serious. NBNL: When you were young, what were your childhood dreams? Patrik: Being a Rock Star and going on tour with Iron Maiden. Anders: … Playing on a big venue. We played with U.D.O. two years ago. That was our biggest stage. NBNL: Wow, you met Udo Dirkschneider? Do you like him? Patrik: He is a very cool guy. Anders: Yeah, he is really nice. He has nothing to prove anymore. NBNL: What will you never do on stage? Patrik: Never hit on bad notes! Tomas: I wouldn’t kill anyone on stage. Patrik: Would you do that outside the stage? NBNL: Please describe Bloodbound in 3 words. NBNL: What do you like about Germany? 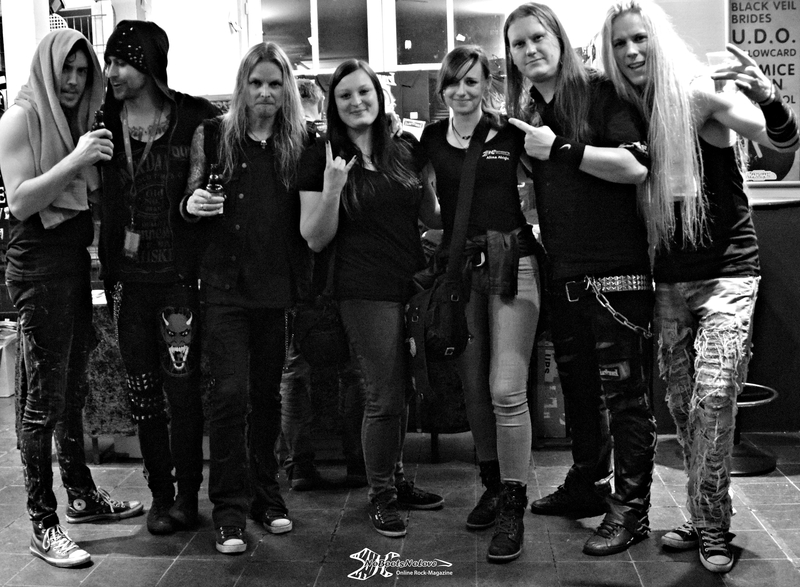 Patrik: We played a lot in Germany and we can see, there will be always more and more people who visit the shows. Here is the best country for playing. Tomas: We like the mortal things about Germany, really because it’s a bit similar to Sweden. It is well organized and you can trust people. NBNL: What do you hate about Germany? Patrik: The language. It is hard to understand. People are in general bad at English. Tomas: I don’t like Sauerkrautsaft. NBNL: Were there funny moments on tour? Tomas: Oh yeah. And it is very important to have fun. We are a lot of people and someone is always telling jokes. Otherwise it makes it boring. And sometimes we watch stupid movies and usually funny stuff, you know? Crazy stuff! Anders: It is the atmosphere. We are joking around and all laugh a lot. NBNL: Can you tell us any joke or a funny situation? NBNL: Do you have an idol/ hero? Tomas: Angus Young is a hero. NBNL: What would be the first thing you will do as a millionaire? Patrik: I would properly buy a nice house and a studio in Sweden. Tomas: I just bought a house … so maybe a studio in the house. Patrik: We live for each other. Tomas: We could get married. NBNL: Are there any ideas for the next album? Tomas: Not really much stuff. There are few ideas. We are starting to work on it after the tour. NBNL: Do you have some other plans for the future? NBNL: Is there something that you want to say to your fans? Tomas: Especially to our German fans: We will come back again in summer to rock festivals. We like it to stay here. Anders: Stay as you are, loud and crazy! Patrik: Spread the words of Bloodbound! Tomas: And drink blood as well. Tomas: Yeah, why not. It’s good for you. NBNL: Did you taste it? Patrik: We always drink it before we go on stage! NBNL: Thanks a lot for the interview and good luck for the show tonight.